How do fifth-grade students use bags for learning reading? Recently I saw a user account called Lincolnreading1 that had published four bags on the same topic: Lewis Hine, an American sociologist and photographer. Hine used his camera as a tool for social reform, and his photographs were instrumental in changing the child labor laws in the United States. I remembered this user had published similar bags. 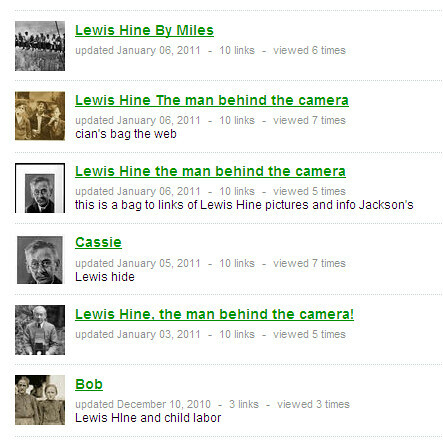 Sometimes the bag title was Lewis Hine, the man behind the camera; sometimes it was just names, such as Bob or Cassie. Lincolnreading1? Why did he create so many bags on Lewis Hine? Is he a photographer? How does he use those bags? Is he a history teacher? After checking out our site’s Google Analytics account, we figured out what was going on, and it really excited us. We would like to share the story with you here. Lewis Hine…A Man with a Camera that Made a Difference! Who is this man and what did he do to change American history? Is he just a man that took pictures or a man that showed the world images they have never seen? That will be your first research question: Who is Lewis Hine and why are we studying his life and works? Please read Kids at Work (pages 92-105) in your Open Court Classics book, then use the Bag the Web resources below to find out more about Lewis Hine. 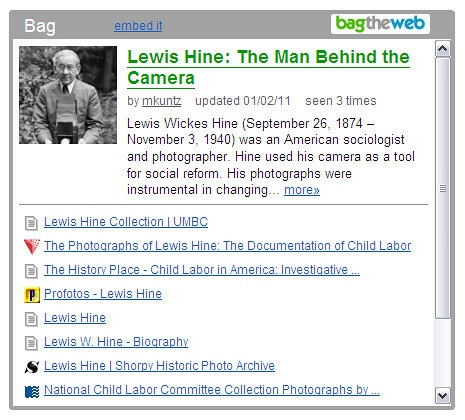 Now create your own Bag the Web for Lewis Hine go to http://bagtheweb.com/ and type in the username: lincolnreading1 and our usual password. Then embed the BAG on your blog page. Please type in Microsoft Word (save in your own folder) and add to your blog page. Extended Response Question for Lewis Hine: With his box camera and his sympathetic eye, Lewis Hine made a dramatic difference in people’s lives. How did he accomplished this and what do you think will be his lasting legacy to the history of America? Use your own words and the text to support your answer. Please give at least two specific examples from the text, make connections about your answer to your own life, another story, or the real world. Explain/infer what you understand about the answer, that isn’t directly stated in the story. Lastly, explain your connections and/or inferences clearly and thoroughly. Wow! This is amazing! Before we launched BagTheWeb, Gordon said to me that teachers could use bags in their teaching. They could create a bag on a project and ask students to create their own bags. These bags could link together. Emerging technologies promote change in the model of human learning. Social networking tools bring us a new learning environment and rewire our brain. We are honored to join the movement. It is so simple to build bags that fifth-grade students can use for their reading learning. Our site can help people collect and organize websites and pages; however, it does more than that. People often surf the web and find good stuff they would like to read later. They re-find it later through a social bookmarking tool. In contrast, social bagging, that is, people collecting relevant webpage links into bags, is for understanding. If users don’t understand the links and the relationship between links, they can’t build good bags. We believe understanding is important during the process of human learning. Our tool is designed to help understand information instead of remembering every piece of information. We are excited about the way Mr. K and the group of fifth-grade students use bags. We also notice more and more teachers are starting using our site. The good news is that we are working on a new feature for educators. We hope that our efforts with BagTheWeb can benefit teachers, students, life-long learners, and researchers.